The Hockey East regular-season title will have to go unclaimed for at least another week. The No. 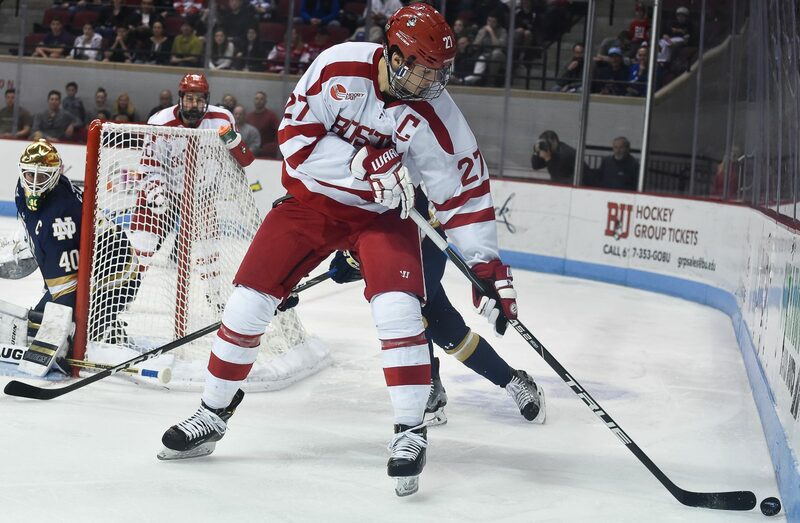 2/3 BU men’s hockey needed either a win or a tie Saturday night against the University of Notre Dame to earn outright possession of the conference regular-season title, but ultimately came up short — dropping a 3-2 game to the Fighting Irish at Agganis Arena. BU (19-6-5, 13-4-3 Hockey East) bounced back after Notre Dame j(14-15-5, 9-6-5 Hockey East) jumped out to a 2-0 lead almost midway through the second period, but the Terriers were unable to push the tying score past Irish netminder Cal Petersen over the final minutes of play, sealing the three-point weekend for BU’s opponents from South Bend. For the fourth time in five games, a team managed to orchestrate a power-play goal against the Terriers, highlighting a disheartening trend in BU’s penalty-kill unit over the past month. Notre Dame left Agganis Arena Saturday night with a 50 percent showing on the power play, scoring twice with an extra-skater to build up a lead that the Terriers ultimately could not catch up to. After the Terriers managed to hold the University of Wisconsin’s power-play unit off the scoreboard seven times on Jan. 10, BU’s penalty kill has operated at a success rate of just 72.3 percent in the following 11 games. During that stretch, BU’s penalty-kill percentage has dropped to seventh in Hockey East at 82.8 percent. Costly mistakes at the end of both the first and second periods proved to be the difference maker Saturday night at Agganis Arena, with Notre Dame taking advantage in both cases. A goal from forward Mario Lucia with .1 seconds left on the clock broke a scoreless stalemate going into the first intermission, while a roughing call on freshman center Jack Eichel at the end of the second period handed Notre Dame a power-play chance at the start of the final frame. Notre Dame would make good on Eichel’s blunder, with sophomore Vince Hinostroza scoring the eventual game-winning goal with just 15 seconds left on the man advantage. For more on BU’s costly last-second mistakes, check out Sarah’s sider. Freshman goaltender Connor LaCouvee saw his record drop to 3-3-1 once the game clock expired Saturday night, marking the second straight appearance in which the Alberni Valley Bulldogs (BCHL) product has been handed a loss. LaCouvee ultimately finished with 19 saves on the night, while Quinn maintained confidence in his backup goaltender after the game. 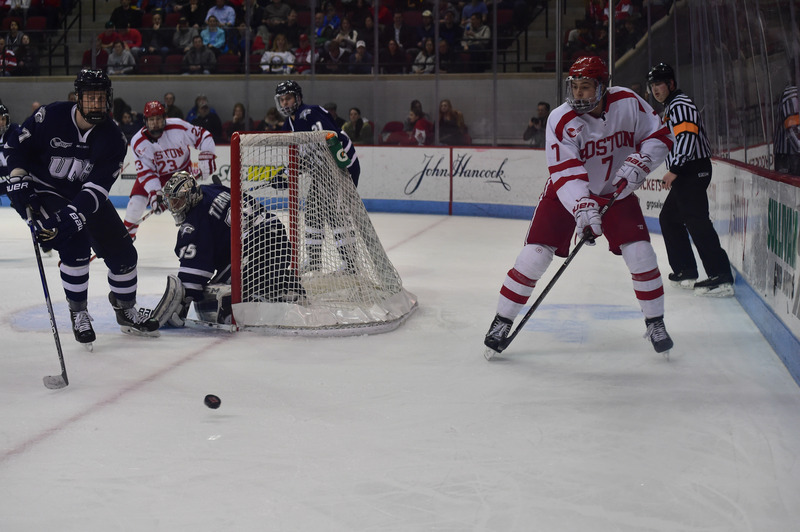 The Terriers have been hard pressed in terms of finding success on the power play as of late. Entering the third period of Saturday’s game, BU had failed to convert on its last 13 extra-man opportunities, with their last special-teams strike coming on Feb. 13 against the University of New Hampshire. Ultimately, BU junior captain Matt Grzelcyk would put an end to BU’s listless power-play streak, scoring his fifth goal of the season at 7:50 in the third period. The Bruins prospect corralled the puck off a pass from Eichel and promptly blasted a shot from the right circle that sailed into the Irish’s net, making it a 3-2 game with a little over 12 minutes to play. Grzelcyk — not especially known for his goal-scoring prowess — has now found the back of the net four times in BU’s last four games. For the first time in 22 games, junior forward Mike Moran found the back of the net, scoring his third goal of the season at 15:39 in the second stanza. After freshman forward Nikolas Olsson gathered the puck behind the Irish net, he sent the disc to a waiting Moran near the slot. Moran did not hesitate, firing the puck past Petersen to put the Terriers on the board. Well, not literally, of course. But after the freshman defenseman collided with Fighting Irish defenseman Luke Ripley early on the third, many feared the worst. The Leduc, Alberta, native immediately fell to the Agganis Arena ice and spun around at a dizzying rate before coming to a stop near the right circle. Hickey was eventually helped off the ice by junior forward Ahti Oksanen and a trainer, and was quickly brought off the bench. No more than five minutes after exiting the game, however, Hickey was back on the bench, loosened up during a break in action and was back in the game for the final stretches of play. The Calgary flames draft pick has been an invaluable addition to the Terriers on both offense and defense, placing second amongst Terrier defenseman with 14 points, while also logging a plus-17 rating in 30 games.